Along with your roofing, siding is one of the most important aspects of your home or business. It's one of the first things patrons and guests will see — their first impression of your property. Due to the significant role siding plays in creating the look of your home's exterior, hiring an experienced contractor to install, repair and replace your siding is essential. At Imperial Building & Roofing, we have more than 30 years of experience providing local homes and businesses with siding replacement and repair services. Turn to our well-rounded crew for an efficient siding installation in Ann Arbor, that keeps your property looking good and protected from the elements. New siding offers one of the first lines of defense against rain, wind, insects, and other potentially damaging threats to your property. With time, it's expected that your home siding will begin to deteriorate. Damaged or deteriorated siding can lead to a number of severe structural issues that can include mold, mildew, and wood rot. To ensure that your property stays protected from unwanted insect invaders and weathering elements, call us today for a quote on siding products and services in Ann Arbor. As with all of our work, we will provide you with outstanding customer service, and approach your project on the basis of your individual needs. We won't consider the job complete until we've earned your total satisfaction. While siding acts as a barrier to insect infestations, mold, and weather, it also plays a big part in maintaining your home's indoor temperature. Outdated or damaged siding allows heat and moisture to build up inside your home, leading to undesirable results. The same goes for cold air that enters your home, as the temperatures drop. This means that you could be overspending on monthly energy expenses, heating, and cooling, and making your home's system work harder to maintain the desired indoor temperature. Replacing the siding, in Ann Arbor area, is an ideal investment in your property, offering greater energy and cost-saving benefits, indoor comfort, and great curb appeal for years to come. In the short-term, monthly energy bill savings may not seem like a major benefit, but those savings can really add up over time. Given the importance of this investment, it makes sense to choose the best siding that fits your property and your long-term goals. As a certified contractor specializing in James Hardie fiber cement siding, our crew is prepared to perform an outstanding job on your siding installation, repair, and siding replacement project. 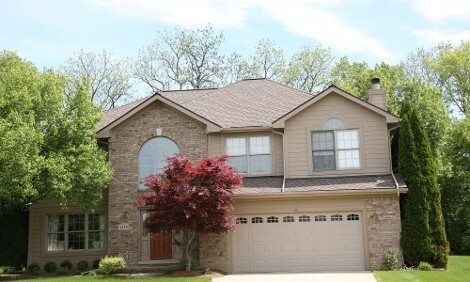 When you put us to work for you, you can rest easy knowing that our experienced siding professionals in Ann Arbor are taking care of your property. Whether you're moving into an existing home, or you have lived in your current home for some time, it might be time to look at replacing your siding. Whatever the case may be, our installation crew will work quickly and efficiently to install your new siding and to ensure its done right. In addition, Imperial Building & Roofing will work with you to match the best material to suit your goals. From fiber cement siding to wood grain vinyl and half log vinyl, we will provide you with a number of options to fit your home's design scheme. As your locally preferred siding replacement specialist, we take our clients' preferences to heart. We consider it our obligation to ensure that your property stays secure, so you can enjoy the peace of mind you deserve. Contact us at (734) 995-9955 for a quote on roofing, siding, skylights, gutters for your home or business, to make sure your property looks great year round. We proudly service commercial and residential properties, holding ourselves to a high standard, and knowing that it is our customers who will assist us with continued growth in our community. Ask us about other services we can provide in conjunction with siding replacement, or roofing, such as new gutters.